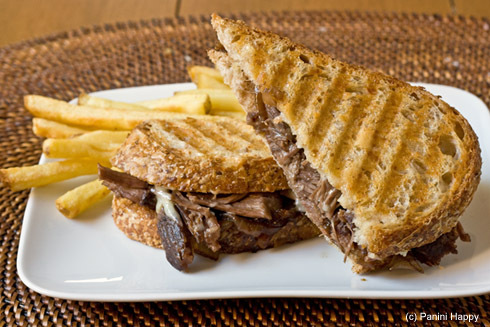 This past weekend I decided to recreate the short rib panini I’d been hearing so much about around town. Port wine braised beef with aged cheddar and onion marmalade – it sounded unbelievable. They serve them at Nine-Ten, an upscale restaurant at the Grande Colonial Hotel in nearby La Jolla, and have been described as “a delectable infusion of flavor” and “the best panini I’ve ever eaten”. That was all the convincing I needed. Dare I say I have a new favorite? “This definitely isn’t bland!” was my husband’s immediate reaction upon taking his first bite. He meant that in a good way, we love big flavor. After simmering in Cabernet Sauvignon, garlic, thyme, beef stock and other aromatics for 2-1/2 hours the short ribs are succulent. Your mouth gets a good pucker from the sweet and tangy balsamic onion marmalade, also cooked extra-slowly to coax out every flavor note possible. Finally, a blanket of melted aged cheddar contributes a pleasantly sharp, butteriness to each bite. Now I’m even more curious about the original version of this sandwich. As soon as I can get myself over to Nine-Ten (and I’m hoping it’ll be very soon!) I’ll definitely bring you a follow-up post. In the meantime, please enjoy the Panini Happy version! Remove the short rib meat from the bone. Shred the meat with a fork and toss in the braising liquid. 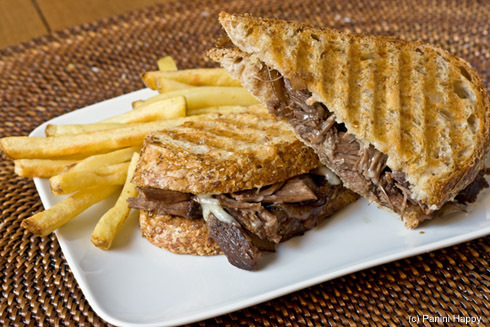 For each sandwich: Add a generous amount of balsamic onion marmalade and shredded short rib meat on top of a slice of bread. Top with about 1/4 cup of aged cheddar and close the sandwich with a second slice of bread. Brush a little melted butter on top. Grill for 4 to 5 minutes until the cheese is melted and bread is toasted with grill marks. 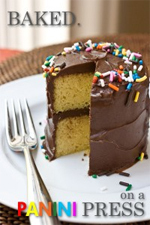 Slice in half, serve immediately and enjoy! Heat the oil in a large skillet over medium heat until it slides easily across the pan. Add the onions, salt and pepper and cook, stirring occasionally, for about 20 minutes, until the onions are soft. Add the sugar and reduce the heat to medium-low. Cook, stirring frequently, for about 10 minutes, until the onions appear dry. Add the vinegar and reduce the heat to low. Continue cooking, stirring occasionally, for about 1 hour, until the onions are soft and dry. Serve warm or at room temperature. Store the marmalade in the refrigerator. It will keep for several weeks. Stove-Top Sirloin Sandwiches + “Big Bowl of Love” Cookbook Giveaway! Braised short-ribs are some of the universe’s best food. There’s just something about that slow simmer that renders them positively irresistable. And what better to do with leftovers than panini??! Will definitely be trying out that onion marmalade! Honestly…all you really need to do is slide that onion marmalade over this way? That’s enough to get folks excited! Add that meat, and it’s party time. Of course you had to try making these, with great success I see! What a wonderful combo of flavors. The onion marmalade sounds great! Sounds and looks absolutely yummy! Wow! This looks heavenly! There’s nothing better than unctuous juicy meat topped with melted cheese and onion marmalade 🙂 oh boy! Love it – and the photos make it look so appealing. I bet the balsamic onion marmalade just makes it. I wish this was on an actual plate in front of me right now… this looks and sounds fabulous! And thanks for the great tip on Nine-Ten Restaurant in La Jolla, I’m up in LA, but have family in Encinitas. Gotta give it a try! OMG this sounds amazing — everything on it is killing me right now and I haven’t had breakfast. I have a weak spot for short ribs so know this will be on a menu coming soon to our house. I’ve been to Nine-Ten, but only for appetizers & drinks. It’s quite a lovely place. My mouth is watering! That sounds absolutely delicious, thanks for sharing the recipe! 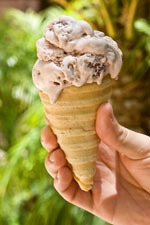 We posted it on our Facebook page to share the deliciousness with our fans- check it out at http://www.facebook.com/cabot! Awesome – thanks so much for the link! Onions are simmering and shortribs are in the oven….. I can tell you this so far, my house smells amazing!!!! Isn’t that the best? Enjoy! It was the best! I would like to make it again for a larger crowd but shortribs are so expensive. Can you recommend another meat that I can slow roasts? Possible some sort of pot roast? So glad you liked it! As for other meats, you might try a chuck roast? Hi Kathy. Thank you so much for including us on your fun blog. Who knew? An entire blog about Panini’s! What fun! I thought you and your readers might like the recipe for NINE-TEN’s Port Wine Braised Beef Short Ribs. It’s what Chef Jason Knibb uses for his Short Rib Panini’s. Happy Cooking! And thanks again! Featured Food Blogger Friday: Panini Happy | yumGLOSS :: Food. Recipes. Entertaining.